Early yesterday morning, my early morning routine was disrupted by the ring of our telephone. Wondering who it might be, and answering in a quiet voice to not awaken the still sleeping family, I was surprised to hear my sisters voice. We often talk in the early evening, so this early morning phone call from her took me off guard, and had my mind grappling what was she about to tell me. After a minute of casual conversation, she broke the news to me. 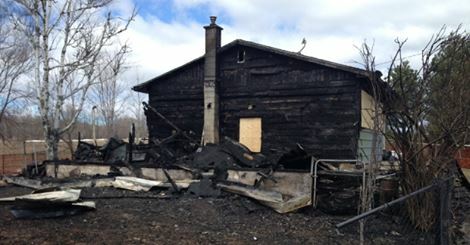 The house that I moved to with my mom after dad died, when I was 15 was destroyed by fire. The news story with a video can be found here. It has been decades since I have lived at this house myself, but with mom having lived there for 35+ years as a single widow, there are a lot of memories within those walls. As the years went on, there was the laughter of our children filling this home, during many, many home cooked meals and wonderful visits with mom. It took a run, to help me clear my head of this tragic news. Yes tragic, but I do have these wonderful memories. Fortunately no one was seriously injured in the fire. The owners have insurance, and they will rebuild. The other fortunate thing, is that my mom having passed away 3 years ago, this is not something she will not have to deal with. This tragedy has reminded me how fortunate I am. I have been very blessed with the homes I have lived in. I am a very wealthy person in these memories. Sadly there are people in the world who have never experienced what it is to have a “happy home”. And in some cases, there are people due to circumstances beyond their control, who have never had that experience of living in a home. With the cost of housing skyrocketing in most Western countries, and with a alarmingly growing disparity between the rich and poor, more and more people are having to take to the streets to live. One of the most inhumane things I have come across of how human beings treat those less fortunate is the use of anti homeless spikes. They had arrived in Canada in front of a business in the city of Montreal, and are being introduced in many countries in the Western world to combat homelessness. In no other way to put it, they are “burning down the houses” of those living on the street. With their house destroyed, where can they now go? Statistics on homelessness in Canada can be found here. I’d never heard of nor seen these spikes before. What a cruel and terrible thing, leaving only more hardship with not a single person’s life actually improved. Thank you for taking the time to read and share your valued comment. This is something I just learned about recently, after reading a news article about it in Montreal. Looking more into it, found it is a growing movement. Wanted to bring some awareness, and hopefully this movement will stop. Am finding they have been removed in several places when people protest enough. Oh Carl, first I want to say how very sorry I am that your childhood home is gone. I did get emotional reading this. For you, as I could feel the memories reliving as you wrote them. I do love how you bring the positive out of your life. But I know that is must feel a great loss somehow. I recently found out that my Grandmother’s home had been sold. I knew it would be and when I finally asked it was as if the finality of it all had hit me. The home was gone. I am truly sorry also, I did not remember your mother had passed. I am sure I have read that. My apologies. So I will say again in case I had not. This was a bittersweet post. You and your family are in my heart and thoughts. Thank you so much for such a caring comment CC. Experiencing your grandmothers house sold would have been very difficult for you. It would have been the stable part of your life where there were some good memories. I appreciate your comment so much. You have such a beautiful heart. Thank you dear friend! “wealthy in memories” – ah, the best way to amass your fortune! It is a bleak reminder to be thankful for what we have, and to remember those who have not. I’m sorry to hear about the loss of your mother’s former home. I’m glad you have the memories (and Mrs. Wright) to keep with you! Thank you so much Karen for your beautiful caring comment. Memories are what keeps me going. Prajakta, thank you for stopping by to read and share. When tough news does come, strength does come from within. It really does. You are always such a tremendous friend and support. Thank you for taking the time to read Adam. I am imagining there is a reasoning why the spikes have been installed in various areas. In the last link, in the bottom of the post it does mention what you were sharing about “to stop anti-social behaviour”. I wish that instead of driving the homeless away, someone would be willing to step up and help solve the situation. 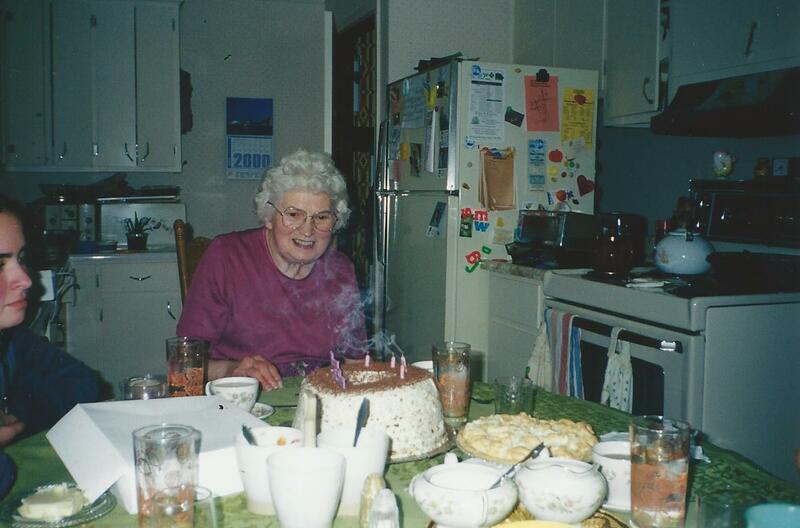 Sorry for the loss of your home, but thankful for the beautiful memories you still have. You made such an important point Amanda. So often this is not their choosing to be in these circumstances, a little support to get people back on their feet would make such a difference. Thank you so much for your condolence. I really appreciate this. I really do have these cherished, beautiful memories. So grateful and thankful for this! Carl, what a touching story about the memories you have of you and your mom and the home you shared after your dad’s passing. It’s so true that some of us are so fortunate to be “wealthy in memories” of having had caring parents provide loving homes so many never get to experience. Thanks for reminding me of this. Isn’t it strange for us to be so attached to our family homes? I am very sorry for the loss of your home. It will live on in your memories. I think what is hard is seeing the changes made to a home after it is sold. When I visit San Diego (my hometown) I drive by my grandparents’ old home and it is so different now. I still am lucky to see it rather than it being taken by fire. My brother still lives in our family home, but when he moves out, I will grieve the loss of the home I can still visit and all it’s memories. This was such a great post with two important themes. 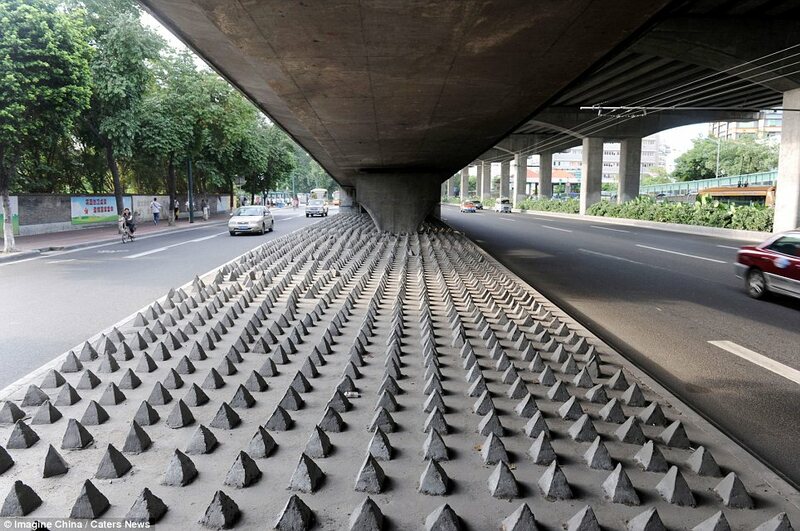 I am appalled with the spikes preventing homeless people to sleep. Very inhumane. Terri, you always leave such supportive, encouraging comments. Thank you so much. I appreciated what you shared about the new owners changing the homes we hold dear to our hearts. In a different twist and perspective, the farmhouse where I spent the 1st 15 years of my life, was sold changing ownership a few times. In time it really went into disrepair from neglect and lack of maintenance. 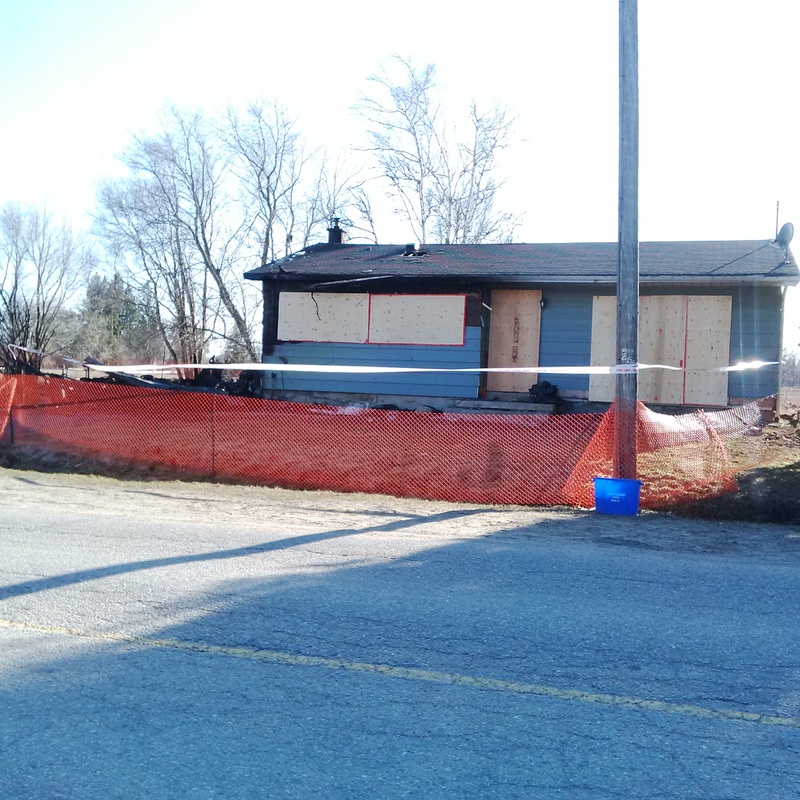 It got to the point where a neighbour who had been inside the house mentioned it was in so rough of shape it was beyond repair, and would likely be bulldozed. My heart was grieving. You said it SO correctly Terri. We really do grow attached to our family homes. I can sense it will be hard for you if your brother does move out of your family home. Take lots of pictures while you have the opportunity. Coming from the era where we paid for developing pictures, plus film cost, I unfortunately hardly have any photos of my former 2 homes from my childhood and teenager years. Thank you for reading and sharing a bit about the former home of your grandparents. Thank you Carl, and I am so glad to hear of that renovation! Good idea to take some photos. Next time I’m there! Take care! I have found it useful not to return to past houses etc. Once I realised they are always changed by the new owner and not always to my taste, I found it better to simply remember, talk with others who knew the places, and look at snapshots. Because it can be heartbreaking otherwise. I came across the spiking issue a couple of years ago. Inhuman. Insane. So much wisdom in these words. My original farmhouse where I lived until I was 15 has been recently renovated/restored. I am glad it has been restored though, because after changing hands it did get in much disrepair. I have thought of maybe returning, to see if I could walk through, but have decided against it for the very reason you mentioned. Memories, conversations and snapshots are so much better. Yes, the spikes really are chilling. The single spot benches you mentioned are another one of the anti-homeless measures listed in that link at the end of the post. It has got to be so demoralizing to deal with all this. The stigma of being homeless is hard enough in itself. It is lovely to the time, read or sleep, sleep or read ahhhh!!! So sorry about the house, C. But I love not only the memories you share from it but how you know yourself to have been a wealthy man in it. I am sorry about your childhood house but what matters is the memories stay in your mind and close at your heart. Glad that the new owner has insurance to cover the renovation.. The spikes are terrible! I hope this is not going to be followed by developing countries like my home country for instance. Indonesia’s big cities are facing increasing number of homeless due to inequalities. The spikes are cruel and not solution to the real issue of being homeless 😦 What a waste of tax payer money! Thank you so much Indah for reading, your condolence, your encouragement and sharing your valued feedback. The spikes definitely do not address the real issue. Sincerely hope Indonesia finds a way to address their situation, involving fellow human beings! I hope so too Carl! Have a blessed Sunday. I’m so sorry to hear about your childhood home and thoughts and prayers for the family who lost their home. Thanks to God that they are are safe. This deeply saddens me, one of my passions is caring for the homeless in ways God blesses me to do. I have not seen this in Oregon, but I just cannot imagine such utter cruelty and disregard for people. Society needs have a greater understanding of homelessness and mental illness and the Government needs to better educate themselves on the same so they can fix the problem instead of adding to it. Thank you for this post. Deana, thank you for reading, and for leaving your very well articulated thoughts. Thank you for your compassion for the homeless and those less fortunate. Here in Canada, winters are very brutal for the homeless. In response, 5 churches in the nearest city from where I live have opened their doors, so that 7 nights a week, from November to April, there is a place for the homeless to keep warm overnight, and to avoid from freezing to death. Here is the link http://barrieoutofthecold.org/our_story/ There has been so many government cutbacks here in Canada, that many people are falling through the social net. You said it so well, in that it is both a society and government issue, in order to understand, educate ourselves, before we move in the right direction. It’s good hear there are people out there that care. Kudos to those churches for showing God’s love to your countries homeless. I was just telling my best friend, who lives in Canada, last night that here in America they make it seem like you guys have it all figured out, then I talk to those who live there and find your just as broken as we are. Guess it’s true, the grass is always greener. Thanks Deana. 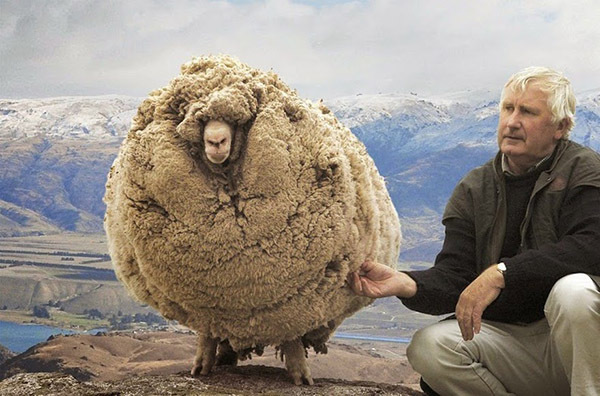 Every country has their quirks and qualities. There has been hostilities against the homeless, where they have been randomly beaten to death in the large cities such as Toronto. At the same time, Canada does have universal health care. Yes, we do pay a lot higher taxes, but if you are sick or injured, we will not be turned away at the hospital. This includes the homeless. We live in a fallen world, but we strive to make it a better place, wherever we are. So sorry to read of the fire and I appreciate you sharing your lovely memories. As you say thank goodness no one was seriously injured. 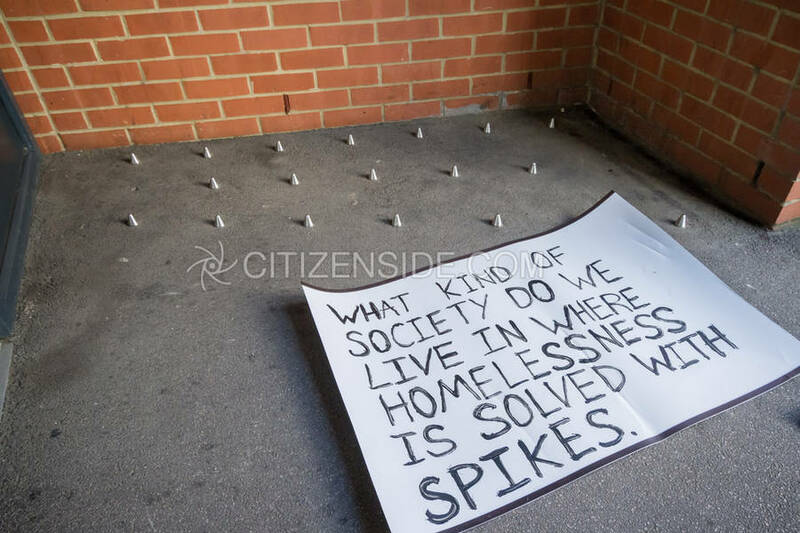 As to the spikes used to discourage homelessness I am sickened by the thought. Each of us is just a few crisis short of being on the street. Bravo to your thought provoking post. May be the messages you so eloquently share be heard. Sue, you have a very tender heart. Thank you for the empathy you have shown for those without homes to live in. You said it so well, There are many people that are living from paycheque to paycheque. Just a few crisis is all it would take to make a person homeless. It can happen to anyone. Thank you for your condolence and sharing such a powerful reply. Those spikes are a sad commentary on our times. I am sorry for the loss of the family home, but grateful that you retain warm, good memories of life there. Those spikes are heartbreaking. I understand property owners might not want some of the negative things associated with homelessness – the stuff, the smell, the waste – but surely this can’t be the alternative. Also, sorry to hear about the fire that claimed your family home. Thank you so much Karen, these spikes are truly heartbreaking. Canada HAS been known as a country at times for equality and tolerance for all people. To have the spikes introduced here, definitely pushes us backwards. I really appreciate your comment. And thank you Karen for your kind words of condolence regarding my family home. I’m so sorry to hear about the loss of your childhood home. It’s tragic when we lose something that was so special to us. But it sounds like despite this tragedy, you are looking on the bright side, and paying attention to the ways in which you have been fortunate. I’ve heard of those spikes that people use to keep out homeless people. I think it’s just devastating that countries are starting to use these “anti-homeless” measures in an attempt to solve the problem of homelessness. I don’t think it will help. I think that we need to be loving and treat homeless people with respect, because that’s what everyone deserves, no matter what their situation is in life. Rebecca, thank you so much for your follow, and leaving such a caring, empathic and well thought out comment. The spikes just will not help, but will just alienate the homeless even more. Any dignity and self respect they might have would be gone. Although the physical house is gone, I’m glad to read that you’ve many happy memories there. The spikes are new to me…thanks for raising awareness…it’s very disturbing…we live in a “free” world but are far from it. I really appreciate you taking the time to read Shawn, and sharing such an emphatic comment. Thank you so much. The spikes really are sad and disturbing. Always have that hope we will all be just a bit more caring and understanding to those less fortunate.